Excavation work is under way and expected to last through the end of December on the future site of the Fred & Pamela Buffett Cancer Center. Crews are working six days a week to dig one gigantic hole which will become the lower level of the Fred & Pamela Buffett Cancer Center. It will take 4,000 truckloads to remove 159,831,340 pounds of dirt. That's like moving more than 12,000 elephants. This translates into 47,100 cubic yards of soil, enough dirt to fill 14 Olympic-size swimming pools. 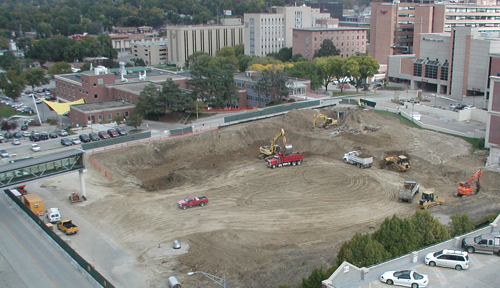 Once excavation is complete, the footprint of the hole will be 119 feet long by 205 feet wide with a depth of 21 feet. Where are they putting all of this dirt. Are they building a mountain somewhere? I need to get my grandsons up here to watch the dig - perfect view from the west corridor windows in the DOC!